Lethbridge, AB – Cole Fonstad’s third-period goal lifted the Prince Albert Raiders (45-7-0-2) to a 6-5 win over the Lethbridge Hurricanes (27-16-5-5) on Saturday night at the ENMAX Centre. 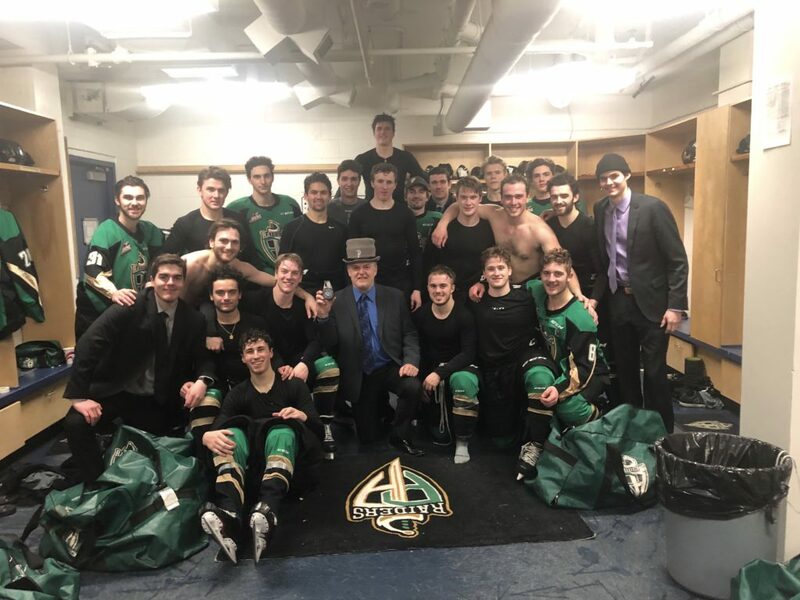 The win was Raiders head coach Marc Habscheid’s 500th career WHL win as a head coach, becoming the eighth man in league history to do so. Fonstad had a pair of goals in the win, recording multiple goals in three of his last five games. Over his current five-game point streak, the Montreal Canadiens prospect has eight goals and four assists. Parker Kelly registered a goal and an assist, while Noah Gregor and Max Martin each picked up a pair of assists. The Hurricanes got the game’s first goal. Shortly after a goal was disallowed for goaltender interference, Jake Elmer finished off a pass from Koletrane Wilson 5:42 into the contest to put Lethbridge up 1-0. Following the media timeout, the Raiders tied the game. Sergei Sapego’s shot from the point hit Eric Pearce in front of the goal. The puck fell behind goaltender Carl Tetachuk and Pearce slid it home for his sixth of the season to make it 1-1 after the first. Early in the second, Kelly gave the Raiders the lead with a power-play marker. Martin’s shot hit Spencer Moe in front of the goal and the puck fell to Kelly. The Ottawa Senators prospect buried the rebound at the 1:48 mark for his 25th of the year. Fonstad increased the lead to 3-1 at the 7:25 mark. He picked up the puck at the top of the slot and wired a shot past Tetachuk for his 25th goal of the season. The Hurricanes cut into the lead less than two minutes later. Ty Prefontaine took a shot that was stopped by Boston Bilous, but the puck squeezed through and just over the goal line at the 8:59 mark. Five minutes later, Igor Merezhko tied the game. His shot from the point beat Bilous to make it a 3-3 game with 6:07 to play in the second. Lethbridge regained its lead with 3:36 to go in the second. After some pressure in the Raiders’ end, the puck fell to Jake Leschyshyn at the side of the goal. The Vegas Golden Knights prospect went to his backhand around Bilous and tucked it inside the post with his forehand to a make it 4-3. Before the end of the period, the Raiders levelled the score again. Sean Montgomery reached out to his right to redirected Brayden Pachal’s point shot past Tetachuk for his 22nd goal of the year. In the third, the Hurricanes pulled ahead with a shorthanded goal. A dump-in attempt took a strange bounce behind the goal on Bilous. Leschyshyn forced a turnover and put it into the empty cage to give Lethbridge a 5-4 lead. On the same power play, the Raiders tied it again. Ozzy Wiesblatt one-timed a pass from Gregor past a sprawling Tetachuk for his 12th of the year to make it a 5-5 game. The Raiders took the lead for good with 6:37 to play. Fonstad made a quick toe-drag move to open a shooting lane and beat Tetachuk for the second time in the contest to put the Raiders up 6-5. The goal held up as the game winner, which is the fourth of the season for Fonstad to tie a career high. Bilous finished the game with 29 saves for his third win as a Raider. Tetachuk made 31 saves in the loss. Up next for the Raiders is a trip to Swift Current on Wednesday night to take on the Broncos (10-38-2-2). Puck drop is 7 p.m. at the Innovation Credit Union iPlex.